19-mile route northwest of Legacy Parkway comes after four years of delay to address controversy. | Courtesy UDOT The Utah Department of Transportation released photos along the state's preferred route of the West Davis Corridor freeway as identified Thursday in a new environmental impact statement. After years of controversy, federal and state officials gave the final stamp of approval Tuesday to the West Davis Corridor — a 19-mile freeway heading northwest from Legacy Parkway through Davis and Weber counties. The Utah Department of Transportation and the Federal Highway Administration issued their final record of decision to end the environmental impact statement process, and give a green light to the new freeway. “This decision has been reached carefully and with great respect for the collaborative efforts of thousands of stakeholders over several years,” UDOT Project Manager Randy Jefferies said. “We will continue working closely with cities, agencies and other stakeholders as we move into more detailed design for this new corridor,” he said. The Utah Transportation Commission voted in May to use part of $1 billion the Legislature authorized to borrow through bonding over the next four years to help pay for this project. Construction of the first $610 million phase from Farmington to Antelope Drive is expected to begin in 2020, and open by 2022. UDOT said that design and property acquisition will take place in 2018 and 2019. The final route closely mirrors the initial course proposed in 2013 that touched off years of delay and protest, although transportation officials say they made several concessions in response to various objections. Environmental groups raised concerns that the project would destroy too many Great Salt Lake wetlands, grass-roots groups feared it would demolish their homes and transportation groups said other options made more sense without encouraging the sprawl that a new highway would. As one example of changes, the project now includes a 1,100-acre wetland and wildlife mitigation plan — including buying up private land now within exiting preserves. Like Legacy Parkway, the new freeway will have noise-reducing pavement; lighting only at interchanges, specially designed to preserve dark skies and not interfere with nocturnal wildlife; 20 miles of trails; two lanes in each direction; and mostly ground-level construction so the road is not elevated. Unlike Legacy, the West Davis Corridor will allow semitrucks, have a speed limit of 65 mph instead of 55 mph and will allow billboards — although cities in the area have the option of banning them. The final environmental impact statement was issued in July — four years later than originally planned — after the agency took time to work through initial opposition consider alternatives. Changes in the initial plan, plus inflation, has raised the estimated cost of the project from $600 million to $725 million. 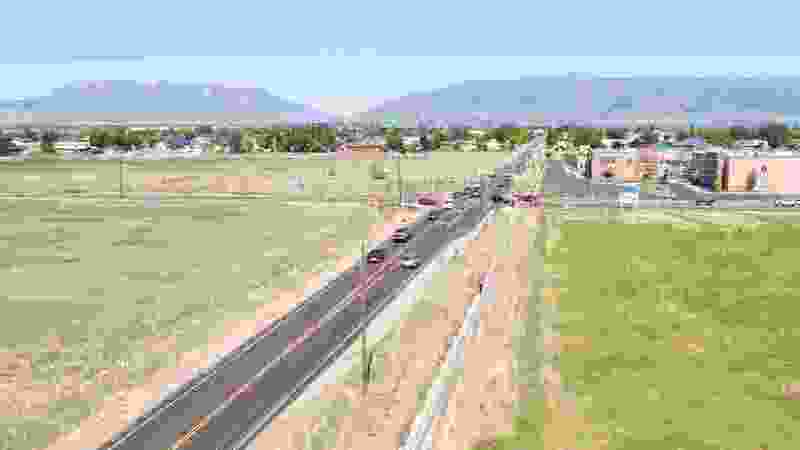 The new freeway would connect with both Legacy Parkway and Interstate 15 at Glovers Lane in Farmington, and end at 1800 North at 4000 West in West Point. UDOT estimates that route will force relocation of at least 25 homes, and perhaps nine more. It would also displace at least four businesses, and perhaps as many as nine. The freeway now is expected to directly impact 64 acres of the Great Salt Lake Shorelands Preserve, only 14 of which are considered high quality. Jeffries has said the freeway is expected to reduce traffic congestion west of Interstate 15 by a third by 2040 compared to what traffic would be there without it. Critics of the project had pushed what they called the “Shared Solution” to avoid the need for a freeway with such things as upgrading east-west streets into more efficient boulevards, adding connected bikeways and improving transit and land use to create compact neighborhoods where residents would not need to commute. UDOT studied the alternative proposal for a year and and half, but ultimately rejected it, saying it did not reduce projected congestion enough. Roger Borgenicht, co-chairman of Utahns for Better Transportation, who pushed the Shared Solution, complained that state and federal rules give highest priority to allowing automobile traffic to travel at the highest speed, not to preventing traffic — so a freeway becomes the favored solution. However, he says he knows of no groups planning lawsuits to seek to stop or change the highway. He also notes that while he doesn’t like UDOT’s final decision, he said its officials did give a long serious look at his group’s proposals and worked cooperatively with it. Some also have expressed concern about the potential profit for two key state lawmakers backing the freeway, House Majority Leader Brad Wilson, R-Kaysville, and Senate Majority Whip Stuart Adams, R-Layton, who are developers with extensive property holdings near the route. The lawmakers have said they don’t expect to cash in and insist they support the project because it will be good for constituents.